The City of Burnaby has had the foresight to include separate bike lanes in its street plans for Lougheed and Willingdon in Brentwood Town Centre. 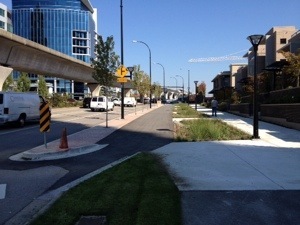 As new developments are completed, the separated bike lanes are built adjacent them. As shown, in the photo, the first section on has been completed on the south side of Lougheed a block or so west of Lougheed. This is a cost-effective method to adding bike lanes that doesn’t impact other users that much if at all. The downside, of course, is that it can take decades to complete the bike lanes leaving gaps in the meantime. In this respect, Burnaby is leading Vancouver which has yet to include separated bike lanes in the street plans for the majority of arterial streets although there proposals to include them on the streets adjacent to Oakridge Mall and along Great Northern Way as part of the Central Valley Greenway. Still, there are no plans to include separated bike lanes on obvious streets such as Main and Kingsway. Main has a high number of cycling crashes which should make it a priority for improvements. Kingsway, along with streets including Burrard south of 1st, Nelson and Smithe were identified as candidates for bike lanes way back in the 1997 Transportation Plan. Burrard south of 1st will be torn up in 2015 for waterworks. This would be an ideal opportunity to add separated bike lanes at a low cost while minimizing traffic disruption. As the majority of shops and businesses as well as an increasing number of homes are on main streets, separated bike lanes along them are critical to enable people of all ages to safely, conveniently and comfortably use bicycles in their daily lives. Now THAT’S foresight! Bravo Burnaby. Burnaby hasn’t gotten around to building sidewalks to its SkyTrain stations in the 12 years since the Millennium Line opened. Pedestrians walk on the road, in the dark this time of year, thousands of them every day. The policy is to wait for adjacent properties to be developed or pedestrians to be killed before sidewalks are built. Your praise is misguided.